Thank you for using a PENTAX K100D digital camera. 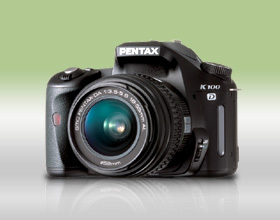 PENTAX wishes to announce the release of Firmware Update Software Version 1.02 for K100D. * The focal length which is input on the [Shake Reduction] menu can be displayed with Pentax Photo Browser3. Only K100D users are permitted to download the firmware update. fwdc156b.bin: This is the updated firmware. After formatting the SD card, copy the fwdc156b.bin file to the route directory of the SD card.